I’m what you could call a nervous host. Although I enjoy entertaining I stress over how much food there is, what sort of seating is available, and whether or not people are having fun. To offset my anxiety I plan in advance. I try to anticipate what people will want and ensure I’m prepared for anything. When things go according to plan, I feel good. However, things rarely go according to plan. No matter how much planning or preparation I do, I can’t anticipate everything tomorrow brings. And this makes me uncomfortable. Deep down I know these uncomfortable feelings indicate a larger issue—a lack of trust. I want to plan my party, my day, my life so I’m prepared for whatever happens. But the future isn’t something I have control over. How do I learn to let go and rest in God’s promise to handle it? The key to being comfortable with life’s unknowns comes down to two words: attitude and acceptance. There’s a game I used to play as a child. One person is blindfolded and another calls directions through an obstacle course. 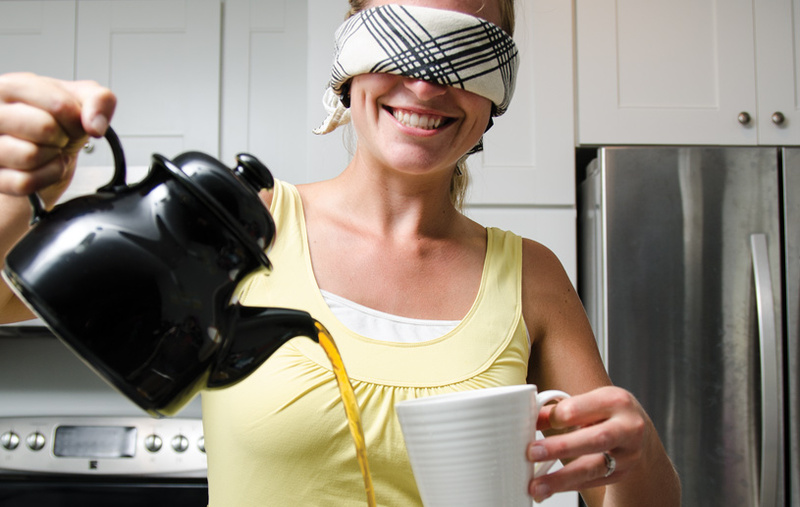 The blindfolded person has to rely on the voice to guide him through the course successfully. I’ve come to realize this is the same way I must trust God’s guidance. As much as I love mapping five-year plans in reality I am travelling through life blindfolded. I don’t know what’s around the corner. I have no idea what’s going to happen tomorrow. I can’t see the obstacle in front of me. Proverbs 3:5-6 helps me keep my attitude in check. “Trust in the LORD with all your heart and lean not on your own understanding; in all your ways submit to him, and he will make your paths straight” (NIV). When I worry do I trust the Lord with ALL my heart? No. But I need to. And I shouldn’t worry about where He’s taking me because He will make my path straight. Even though I don’t know what’s going to happen tomorrow, I can choose to believe God has it under control and will take care of me. One of the main reasons I make plans is so I can have a comfortable life. I want to be a good steward of my resources and to me this includes a roof over my head and food on the table. If I didn’t plan for the future this may not happen. In my mind the worst thing that could happen is I make a poor decision or miss out on a great opportunity. But what I need to accept is this is not in my control either. Just because I plan for a nice life doesn’t mean it will happen. I can do everything right and still end up on the street—again, I don’t know what will happen tomorrow. One of the best examples of acceptance is the story of Joseph in Genesis 37-50. By all accounts he did everything right. He had a great relationship with God and even was given prophetic dreams and visions. He lived a pure and honest life. And what did he get for his trouble? Thrown in a well, sold into slavery, put in prison, and then forgotten about completely. From a human perspective Joseph had every right to be upset about his situation. But he accepted God’s sovereignty over his life and submitted to his circumstances. No one is exempt from hardship. It’s a part of life. From one day to the next all my wealth, security, and comfort can be taken away. I need to accept this so when trouble does come, I am in a place to welcome it.